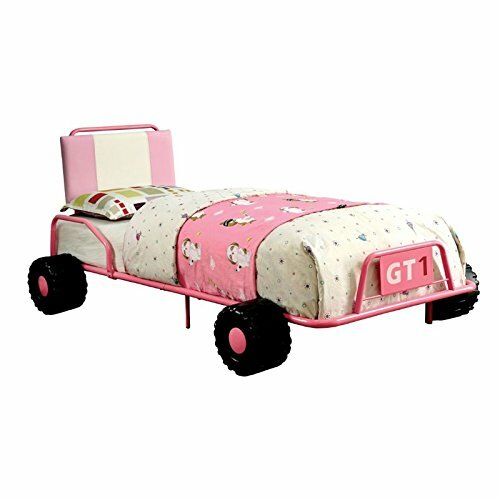 Stylishly sleek, the O'Connor racecar-themed bed adds an atmosphere of joy and fun to your car-enthusiast child’s room! a finely-detailed car-shaped bed complete with realistic wheel accents is ready to whisk your child off to sleep, its padded leatherette headboard soft enough to ensure their continued comfort. The life-like car elements will help your child speed off to dreamland or hit the ground running in the morning. Product frame is constructed from solid wood and wood veneers. Wipe clean with a damp cloth. Assembly required. Spot clean recommended. Minimal assembly required. Product made in Viet Nam. Once assembled, product measures 33.38 inches high by 53.88 inches wide by 81.13 inches deep; 30-days hassle-free replacement parts warranty. Pictures are for illustration purposes. All décor items are not included in this offer. Measures 33.38"H x 53.88"W x 81.13"D.